Born: 13 January 1820, Nybro, Kalmar, Sweden. Died: 7 October 1874, Pretoria, South Africa. Magnus Johan Frederik Forssman, surveyor, was the son of a prominent Swedish lawyer, Jonas Samuel Forssman and his wife Anna Catharina. He qualified and practised as a government land surveyor in Sweden. In 1863 he came to South Africa with his wife Gustava and five daughters, on the recommendation and in the company of his younger brother, Oscar W.A. 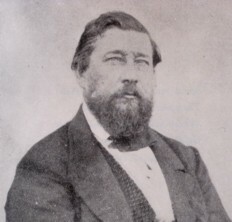 Forssman, who had already established himself as a businessman in Potchefstroom. They landed in Durban in November 1863, sold their cargo and travelled to Potchefstroom by ox-wagon, arriving in February 1864. In August that year Magnus was admitted as a land surveyor in the South African Republic (Transvaal) and the next year the government commissioned him to survey the town of Potchefstroom. He was appointed as the first surveyor-general of the republic in April 1866. Soon he was proficient in Dutch, but his pioneering work was looked upon with distrust, suspicion and antipathy by the majority of the Dutch settlers. In 1868 he compiled instructions for Transvaal surveyors, and urged that proper surveys be made of government owned farms. His surveys and maps formed an important contribution to the so-called Jeppe*-Merensky* map of the Transvaal, compiled in 1868 by Dr A. Petermann. Forssman's wife and children returned to Sweden in 1868, so that his last years were lonely. He was a burly and genial man, able, honest and energetic in his work, and the first master of the masonic lodge in Potchefstroom. His survey work on the eastern border of the republic in connection with the Transvaal-Portuguese treaty of 1869 was acknowledged by the Portuguese government by his nomination as a Chevalier of the Order of Jesus Christ. His health gradually failed over a period of several months in 1874, leading to his death. The fact that his imposing funeral in Pretoria was attended by the president and executive council of the republic, the chairman and members of the Volksraad, the Bishop of Zululand and other prominent citizens, indicates his high standing in the community. Forssman, A. Magnus Johan Frederik Forssman, 1820-1874: Surveyor-General of the ZAR, 1864-1874. Pretoria, 1956. Forssman, O.W.A. A guide for agriculturists and capitalists, speculators, miners &c, wishing to invest money profitably in the Transvaal Republic, South Africa (foreword). Cape Town, 1872. Magnus Johan Frederik Forssman. Genie, at https://www.geni.com/people/Magnus-Forssman/6000000002596002106 as on 28 November 2016. National Automated Archival Information Retrieval System (NAAIRS). http://www.national.archives.gov.za/naairs.htm Documents relating to Magnus Forssman / landmeter Forssman. Volkstem, 10 October 1874, p 3, In memoriam. Watson, W.C. The Jeppe-Merensky map of the Transvaal, 1:1 850 000 - 1868. South African Survey Journal, 1968, Vol. 11(5), pp. 12-19.